Students at Cristo Rey De La Salle school in Oakland enjoy the unique Corporate Work Study Program. From left to right: Osmín Chacón-Díaz, Enaisa Gutierrez, Julissa Montano and Alejandro Conde. Last year, a new school in Oakland’s Fruitvale neighborhood opened its doors for an inaugural freshman class of 65 students. Located on the campus formerly home to St. Elizabeth High School, Cristo Rey De La Salle East Bay High School (CRDLS) provides a unique path for students from low-income families to attend a four-year college and get on track to a successful career. 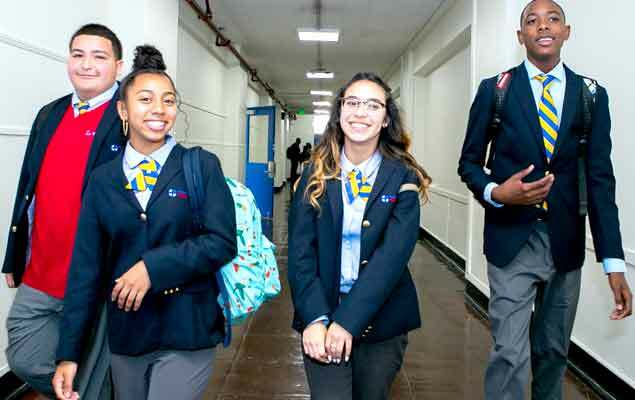 Cristo Rey schools establish a culture of high expectations by blending a rigorous and personalized college preparatory curriculum with a corporate work study experience that prepares students to succeed in college and in life. Cristo Rey De La Salle is the first Catholic High School in the country to implement the Summit Learning curriculum across its entire student body. Summit is a model that empowers students to become self-directed learners and work through content and assessments at their own pace. The platform uses data to track students’ progress and show teachers where improvements are needed. Teachers mentor students in weekly check-ins, providing ongoing feedback and serving as a coach and advocate. Hernandez says the feedback from students and parents on the curriculum has been very positive. “I really like the curriculum because it’s at your own pace – you don’t have to wait to move forward, or if you’re struggling, you have the time”, said Julissa Montano, ninth grade student at Cristo Rey de la Salle. 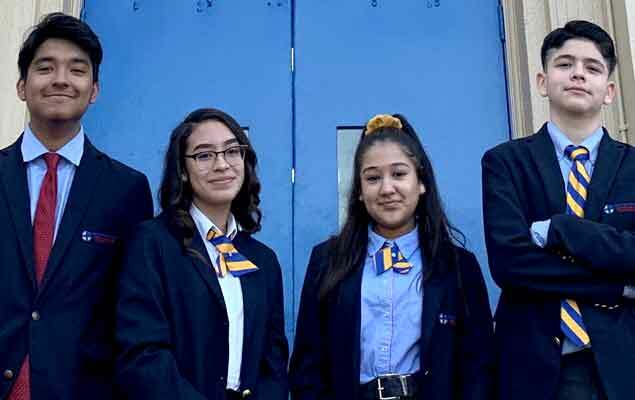 Cristo Rey De La Salle school in Oakland establishes a culture of high expectations by blending a rigorous and personalized college preparatory curriculum with a corporate work study experience. Students also clearly enjoy the Corporate Work Study Program, which is a unique part of their education. Every student works in a professional setting five days each month, allowing them to contribute half the cost of their education while gaining invaluable, real-world work experience that prepares them to become better thinkers, visionaries and global problem solvers. Students work in entry-level office positions with Bay Area businesses, nonprofits, governments and community organizations in a variety of industries, including financial, health care, automotive, education, and food & beverage settings. Companies participating in the program include California Bank of Commerce, Chevron, Deloitte, Saint Mary’s College of California, Diocese of Oakland and One Toyota of Oakland. Julissa Montano works in the IT department at Deloitte, where she helps fix computers and set up new computers for employees. She adds that she’s learning how to be more confident in a corporate environment and communicate with adults. Her career goals are to study computers at a four-year college and work at a large company like Deloitte. Osmín Chacón-Díaz, also a 9th grade student, works at Armanino in different areas such as marketing and with the main receptionist, where he enjoys interacting with people. “I really like my job,” says Chacón-Díaz, whose career goal is to be an engineer. “Working with adults every day makes me more confident”. Gutierrez is gaining her work experience at St. Elizabeth Elementary School, where she does filing, sending emails, helping students with their homework, and translating for parents who lack English skills. “I’m building my skills interacting with adults, gaining teaching skills, and offering my ideas on many things,” she says. Her career goal is to become a trauma surgeon. Student Alejandro Conde works at Chevron headquarters in San Ramon. Before he goes to college, Conde says that he wants to figure out his career choice. The Corporate Work Study Program at CRDLS allows families to pay only a small portion of a student’s tuition. Students cover approximately half of their tuition through their corporate work and a large portion is covered by scholarship dollars funded by school donors and friends. Approximately ninety percent of graduating students from other schools in the Cristo Rey network enroll in college, which is about forty percent higher than low-income graduates of other high schools. Also, about 35 percent of Cristo Rey graduates complete bachelor’s degrees in college and are three times more likely to complete a bachelor’s degree by age 24, compared to the total U.S. low-income population. CRDLS is looking to recruit approximately 110 new freshmen for the 2019-2020 school year. It will also be accepting 15-20 sophomore transfers. The application deadline is March 15.